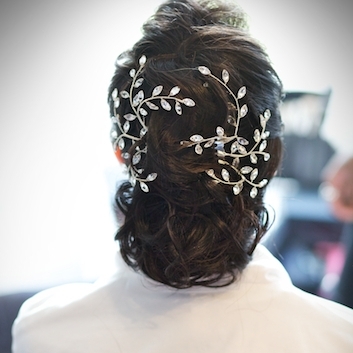 CHOOSING BRIDAL HAIR ACCESSORIES FOR YOUR WEDDING DAY? Sounds familiar? If I’d a pound for every time I hear a bride mention this in the first minute of a consultation I’d have indulged in a lot more shoes! This week I’d like to offer some good sensible advice and I hope, help you make the right choice for your wedding day. If hair is to be worn up then the choice is generally wide open. It is a lot easier to secure combs, the teeth of the decorative bridal hair comb can be anchored well into the hair and for extra security, a pin can be slipped into the hole of a tooth on the comb. Decorative bridal hair pins can only be worn in an up do, whether that is all the hair up or just a section of hair, I suppose that pretty much goes without saying. Bridal headbands can also work well in an up do, though I confess to having a pet hate for seeing a silver band sitting on top of a beautiful hair do. When hair is worn up I would suggest one of the following options. Doing the hair around the headpiece to cover the band, this would mean that the headpiece would have to stay in place all day, generally this probably won’t be a problem, but should be considered. Have the headband covered to tone in to your hair colour, thus sitting much more discreetly against the hair. For clients who choose this option, I hand stitch an appropriate coloured velvet ribbon around the band before mounting the decorative element on top. I use velvet as it grips hair gently, a little like velcro, whereas, I think the wrapped satin can be slippery in the hair and not look as neat. ARE YOU A BRIDE WEARING YOUR HAIR DOWN? If the hair is to be worn down then the choice is more limited. By using a texturizing powder and some nifty back combing, a comb can be secured but won’t be as secure as a headband. Headbands are generally the best option for hair worn down, no matter how short, thick or thin the hair is they can pretty much be worn invisibly. The secret to achieving this is how the headband is popped on, keep reading and I'll let you in on it. IT ISN’T JUST ABOUT THE HAIRSTYLE! 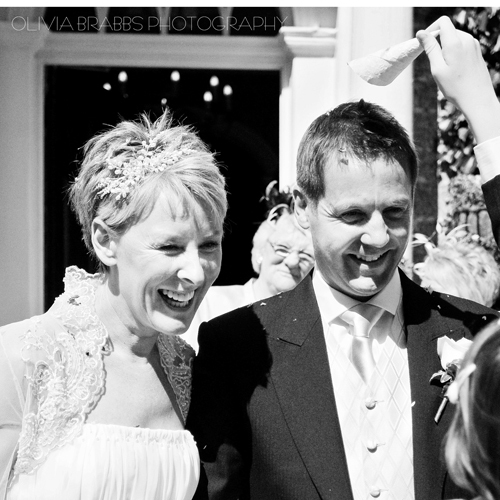 If you are a bride wearing a large or a heavy headpiece for your wedding day then I’d strongly recommend a headband as this guarantees that it will stay put, you can party the night away and it won’t launch off your head like a lethal weapon whilst spinning around the dancefloor. If you are wearing a heavy ornate bridal hair comb around the back of the head in an up do then I’d suggest considering asking for some extra little loops to be added so that the piece can be pinned in place more securely. There are 4 main types of comb you see around, I’d only recommend, and indeed only use the first type. Why? The simple answer is that they are by far the best. They are metal, they don’t snap like plastic, they are flexible enough to be formed around the head (which to be fair to the other 2 metal styles is true) but the difference with the first one is that it stays in far, far, far more successfully than the other metal ones. The plastic ones are ok but pale into comparison, and if you try and pin them for extra security, they snap easily. They don't have than quality finish either. I use 2 types of headband, those I use are metal headbands and a broader satin covered plastic headband. The wider one is only used when that style is integral to the design of the piece. I’ve search high and low for the most comfortable ones I can find as they simply aren’t as comfortable as the metal ones but they really can look the part. The bands I favour, design permitting are metal ones. I take on board and agree with every client who complains about how desperately uncomfortable these bands are. What I need to say is, you need to try the ones I use first before discounting this option. As with the satin headbands I’ve trawled high and low and there is only one solitary supplier I’ve found where I can purchase good metal bands, and I’m not revealing my source, sorry! The one’s I use aren’t completely rigid, they can be reshaped and moulded to suit each clients head shape. I must have a 99% hit rate or higher on converting headband haters with my bands, once they’ve tried them! If you need to try one for yourself to be convinced, I'll send you one before you order. Invariably most people pick up a headband and pop it straight down on top of the head. If you are looking to wear and Alice band style or have a heavy detail that runs ear to ear across the band, then this is fine, however for side decoration there is a knack. Nip the feet of the band together and place on the head at the parting. Slide the headband along the scalp, parting it under the hair, it may need a little tweaking but it should (if done correctly) be pretty much hidden. For the best finish, wear your detail on your parting side. In 99.9% of people it looks better balanced with your facial features, it covers the parting and the thin bit and leaves you with your better side with the full hair looking lustrous. It gives you two good sides to be photographed on. People often ask for hair clips and for the most part I avoid this solution like the plague. For the odd small piece the little alligator clips can be used but they are difficult to disguise or cover and they stand off the head, all in all I think they look peculiar and to be honest, are a lot less secure than they look with any weight. The snap clips can be a good option for little flower girls but they either need a soft flower that is big enough to cover the clip or, you don’t need to mind seeing the clip in the hair with something smaller added to it. Shaping headband - If you order one of my headbands you will be be able to shape it to fit your head, just flex gently rather than bend an angle into it. Hairspray on haircomb - If you spray hairspray on the back of a haircomb it will help it grip securely into your hair, remember though to avoid spraying the detail as it will dull and tarnish it. 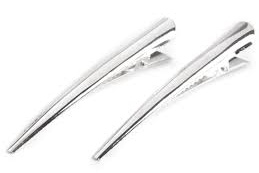 Bending leg of hair pin - If you bend the leg of a hairpin, it forms a hook that loops into your hair, thus preventing it from slipping out easily. Decorate don't use to secure - You should use your headpiece to decorate your hair do, not to secure it, particularly with combs. Style the hair securely, then add the detail. Don't forget to give me a shout if you have any questions or would like any advice!